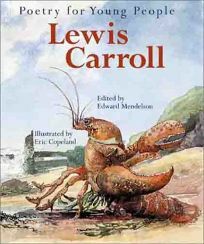 The Poetry for Young People series adds Lewis Carroll, edited by Edward Mendelson, illus. by Eric Copeland. All the favorites can be found, from ""The Walrus and the Carpenter"" to the classic ""Jabberwocky,"" and annotations supply definitions for challenging vocabulary. Copeland, meanwhile, works against the indelible John Tenniel images with robustly colored art, the realistic grounding of which throws the absurd elements into droll relief.